A choice little woodlander – unlike any of the other common species. 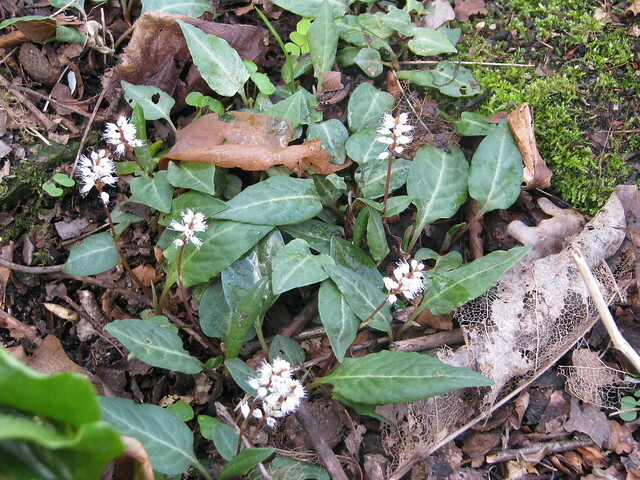 Slowly spreading to make a colony of stocky little plants with small silvery green leaves, and in spring, makes short spikes of pure white flowers with black anthers. 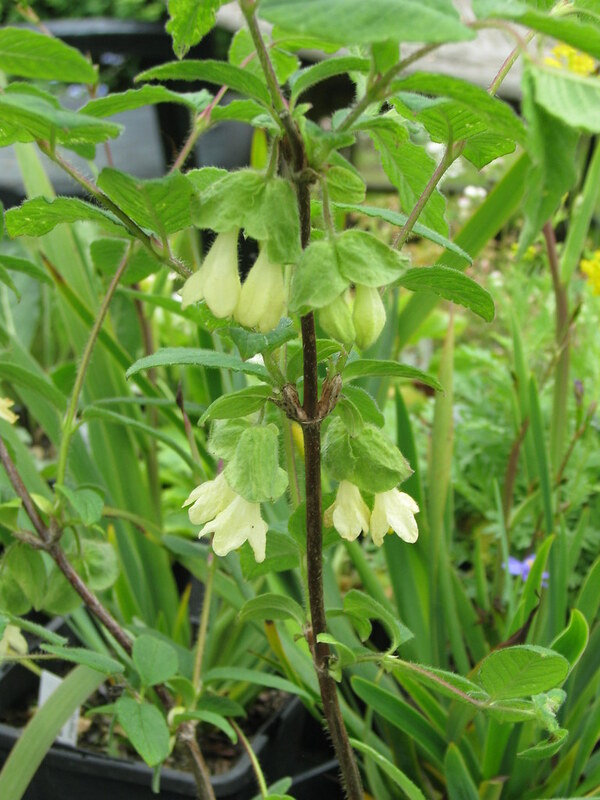 Adaptable but best in moist but well-drained woodsy soil in shade. Never even slightly weedy. In fact, keep an eye on it or it might get lost. 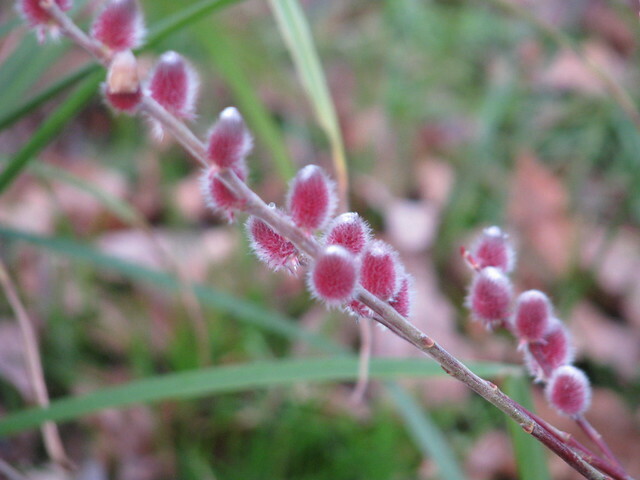 Maybe the idea of a pink flowered willow sounds a bit kitsch but I promise you this one carries it off very tastefully indeed. This is a naturally occurring form of gracilistyla (not chaenomeloides as was originally thought) and can be quite a substantial shrub in time, very much like its relative the black willow (melanostachys) but with greyish twigs and leaves. 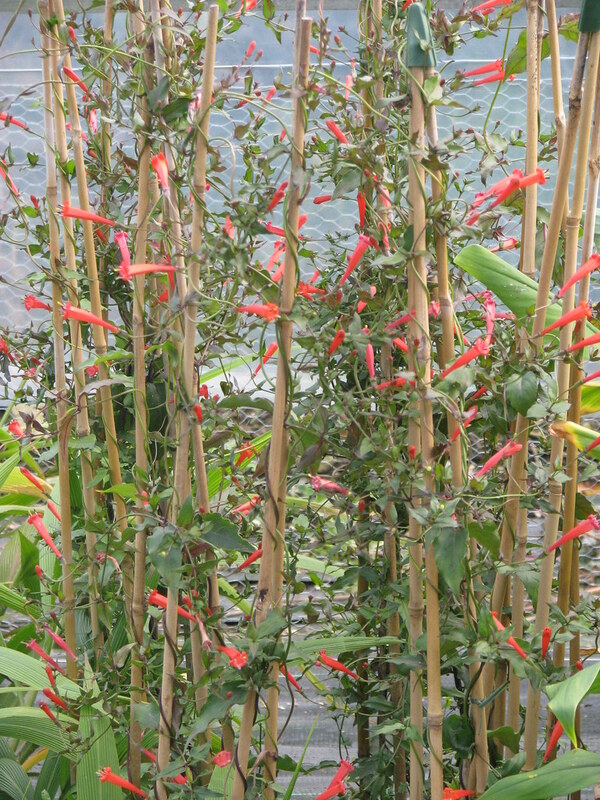 An extremely pretty small herbaceous perennial climber from Brazil with lots of 2 in pure scarlet tubular flowers in late summer and autumn. Cultivation information is a little scarce but American sites seem to agree that this will grow in USDA z8 and as I grow quite a lot of z8 plants here I’m pleased to give it a try. 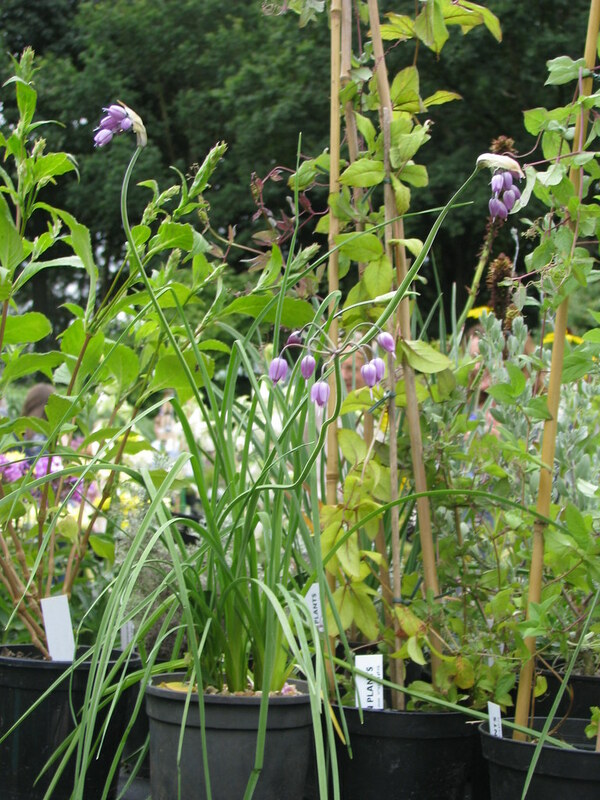 Even if it ends up being one of those plants that needs bringing in in the winter it will be worth it because its modest size and the fact that it dies down completely to tuberous roots in winter makes it very easy to handle. 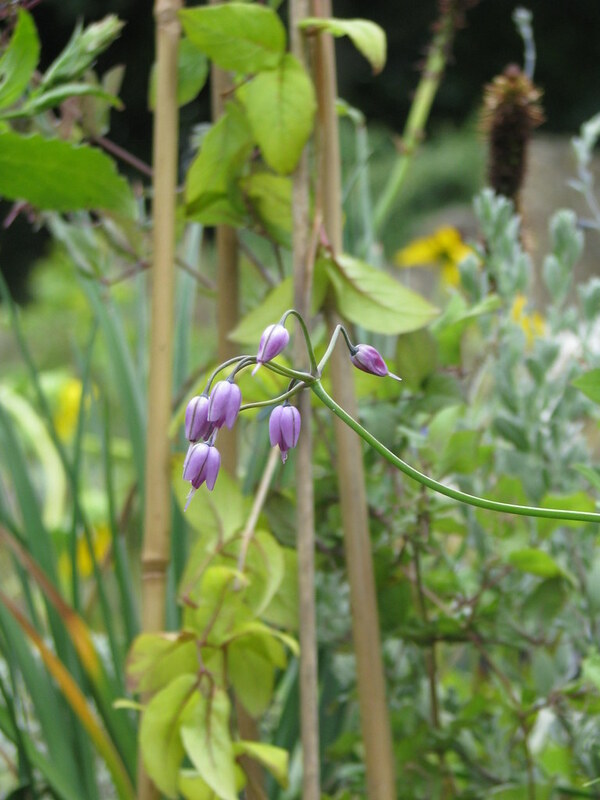 An ideal small vine for decorating shrubs or putting on a trellis. A slow growing and compact ‘spotted laurel’ up to about 4ft high with attractive narrow dark green foliage, lightly spotted with yellow. 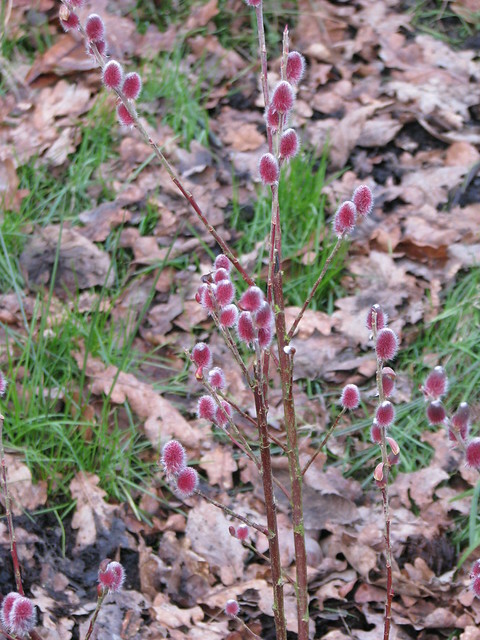 This is a male clone with striking dark red flowers in conspicuous branching sprays in early spring. For exactly the same conditions as the common species but much choicer. 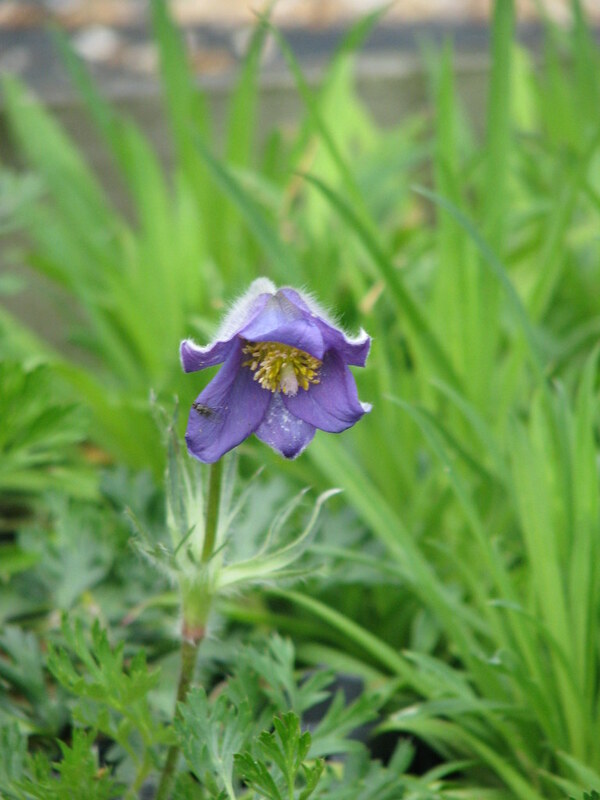 Many thanks to Nymans for the original plant. 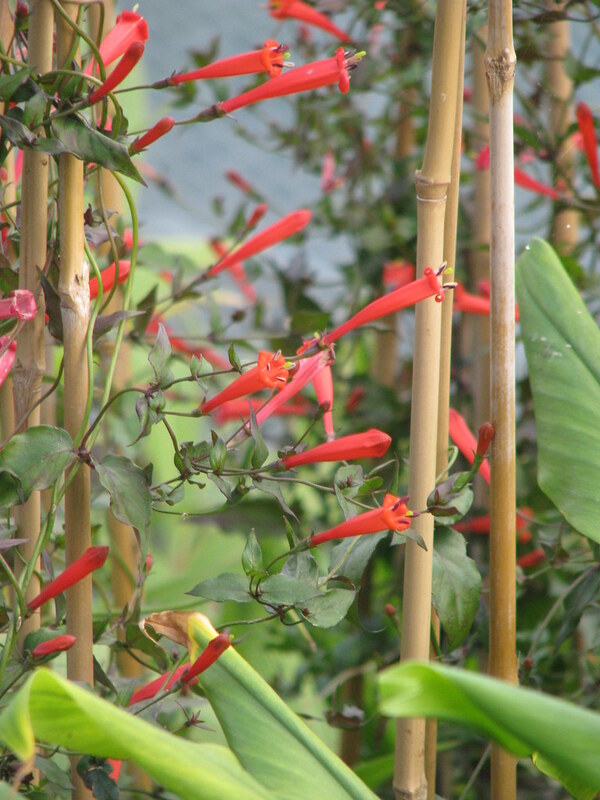 A brilliant species producing 3in long tubular vivid red flowers from early spring until well into summer. 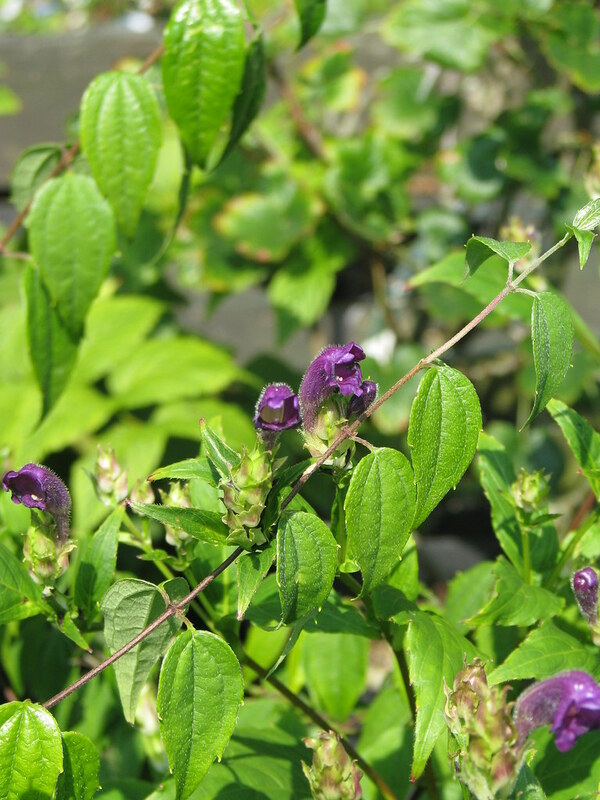 The foliage is not evergreen (contrary to the specific epithet) but is a rich soft purple when it first emerges, and the top-most pair form a dish around the flowers. Fully hardy and easy in a sunny spot on a wide variety of soils. Much better than x brownii, which for some reason is usually recommended over sempervirens. 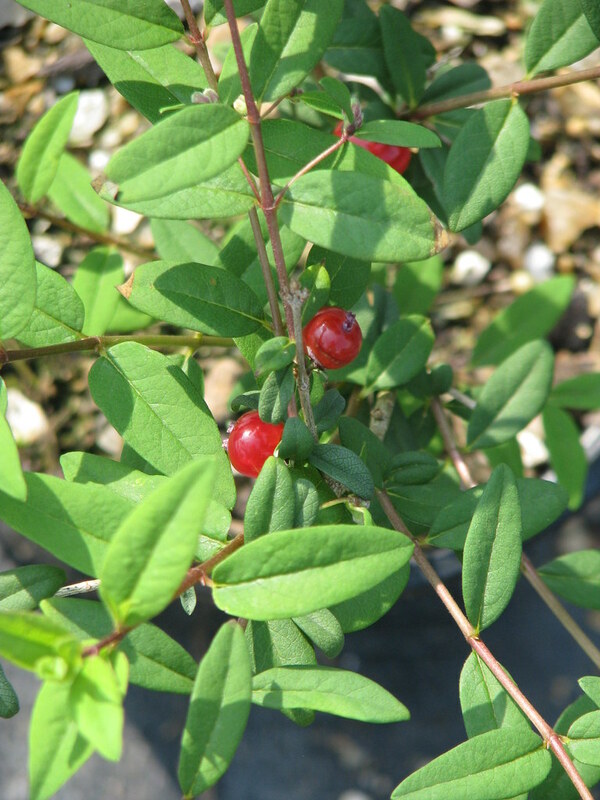 Grow it in a Pyracantha and make an ersatz Embothrium! A perfect little creeping evergreen fern – like our native deer fern but only 2-3ins high. 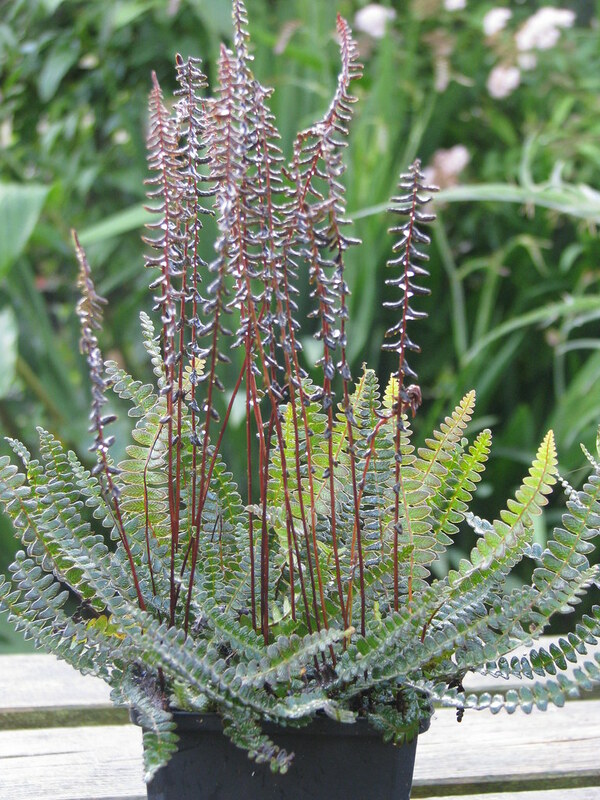 The new fronds are copper tinted and the plant can cover a large area in time – ideal under and amongst moisture loving dwarf shrubs and larger alpines. Fully hardy. 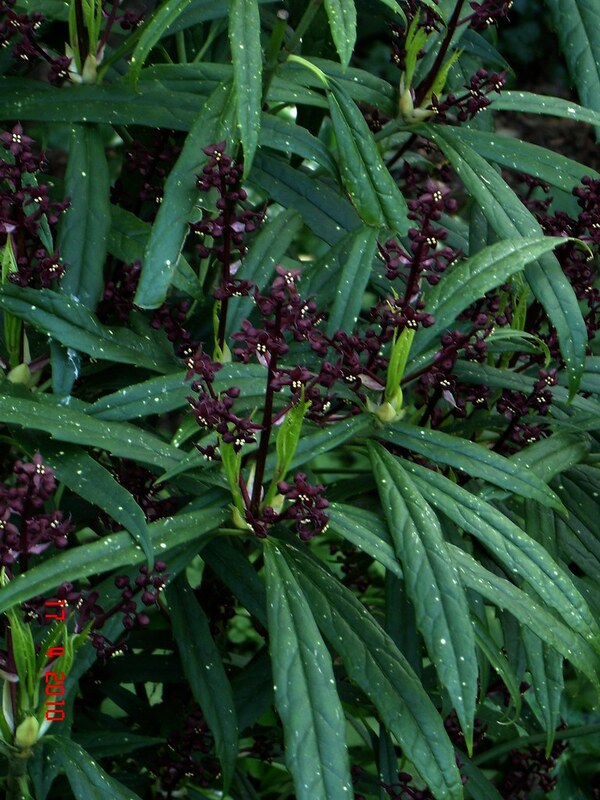 A colourful medium-sized evergreen shrub from New Zealand - the foliage olive green/khaki, speckled and tinged with purple and black. It sounds weird but is actually rather lovely. 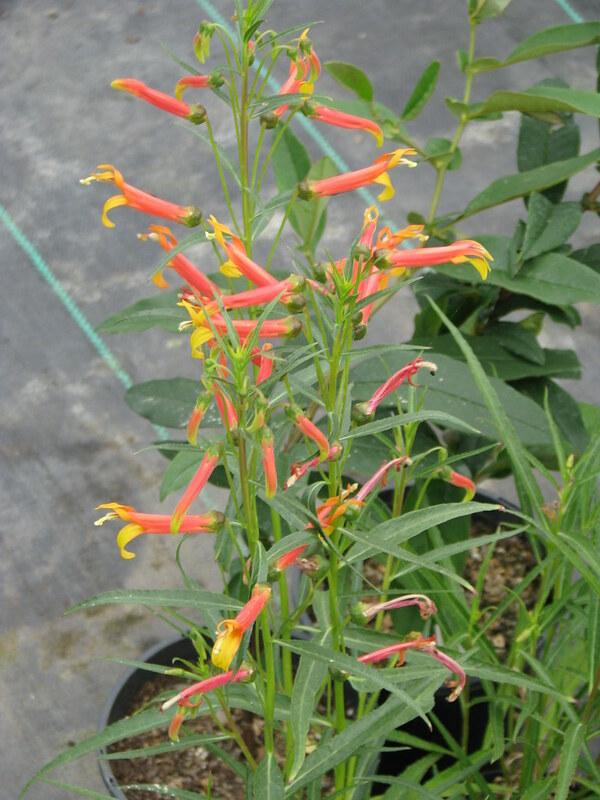 The flowers are small and mustard yellow and not especially ornamental but pleasant. 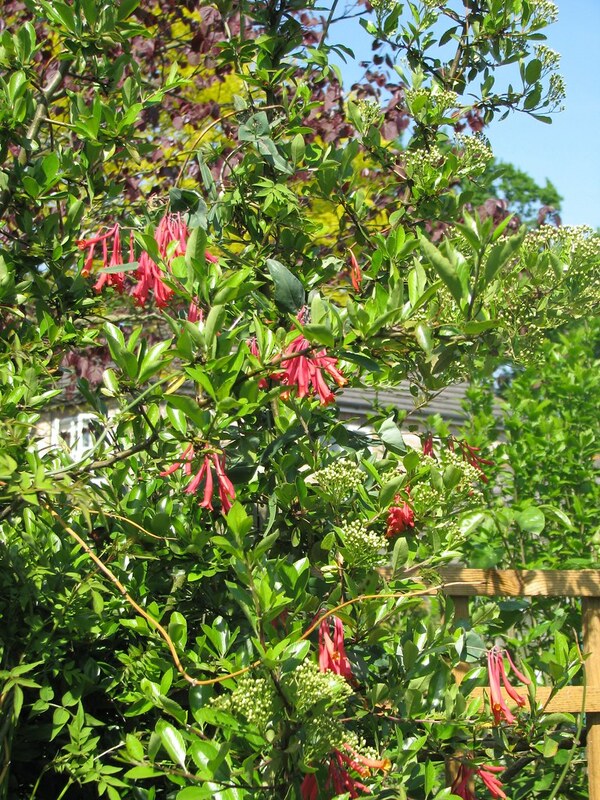 This has proved to be a good hardy shrub for sun or part shade, but best kept out of freezing winds. 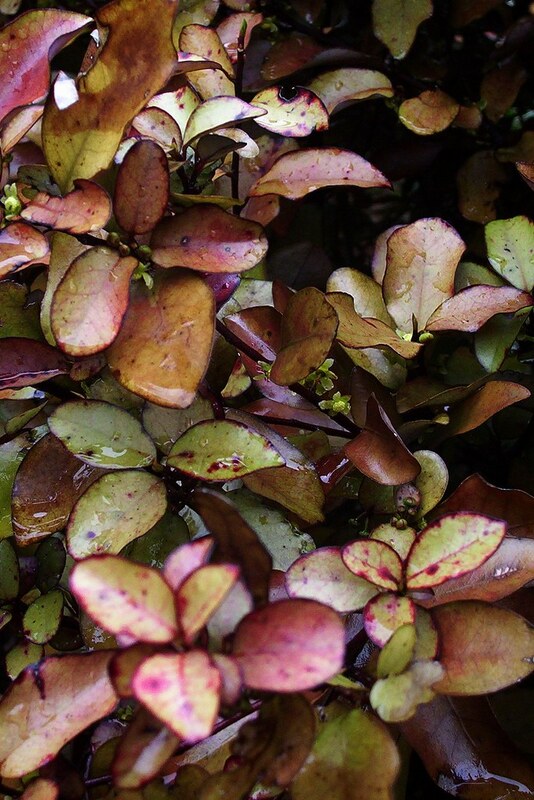 New Zealand plants are often cryptically coloured in shades of brown, yellow and even orange and black, almost as if they want to look sick or dead. I assume this is some sort of camouflage against herbivores. The results are not attractive to everyone but are always intriguing. The only large native herbivores in NZ are birds, and in particular, until relatively recently, the giant flightless moa so I guess that's what they were hiding from. 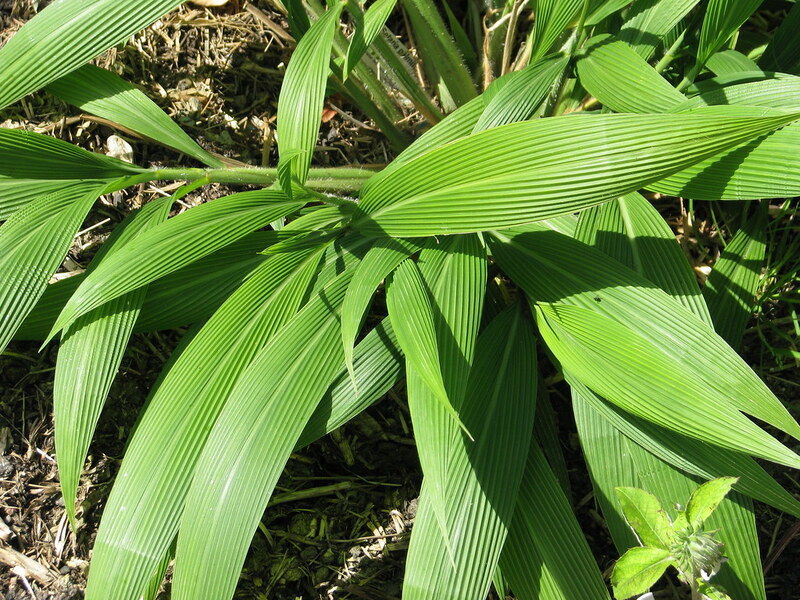 A large and dramatic grass with strikingly ribbed leaves and forming a tussock to about 2ft high and twice that across. 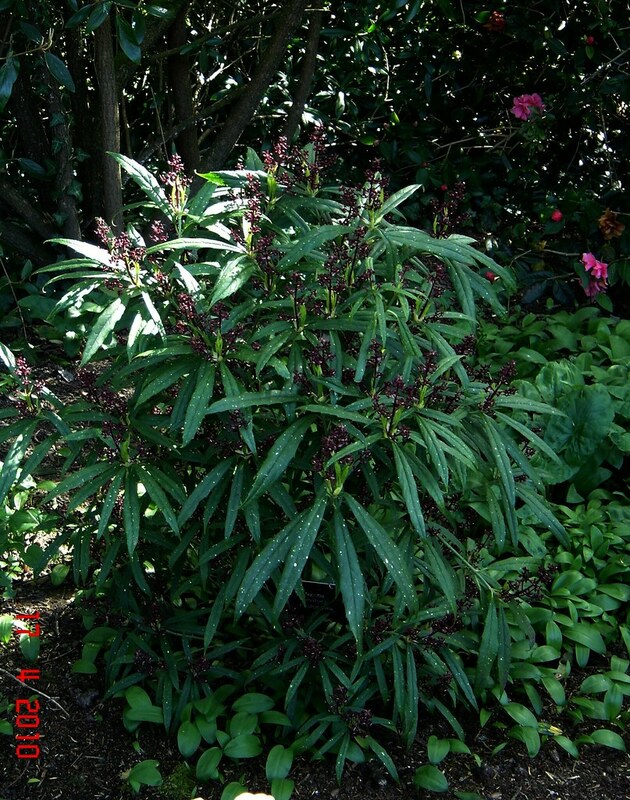 The flowers are relatively modest millet-like sprays but the overall effect is very lush and exotic. Usually considered a tender species for subtropical bedding but I've had it for years in open borders both on heavy clay soil and the better drained soil at the nursery, mulched with straw in winter. It usually gets heavily bitten back in winter but there's always been enough root for it to come back strongly in spring. 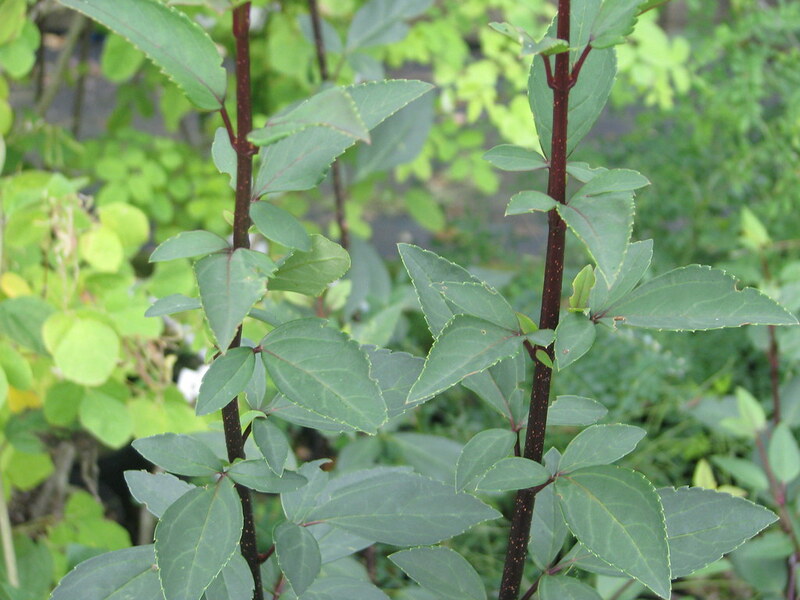 A relatively tall sub-shrubby species almost unknown in cultivation it seems - the name is very much in doubt too. 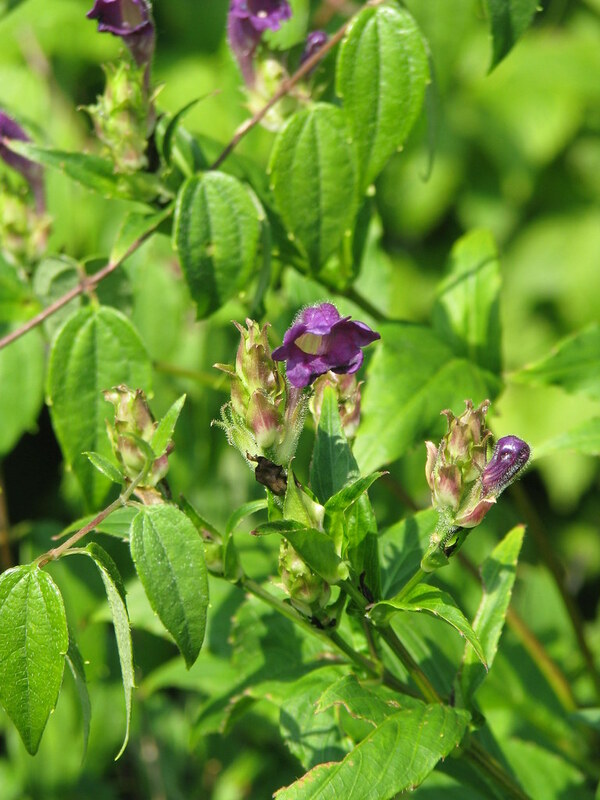 Nonetheless an interesting species looking somewhat like a Weigela out of flower but with rich purple flowers in late summer. 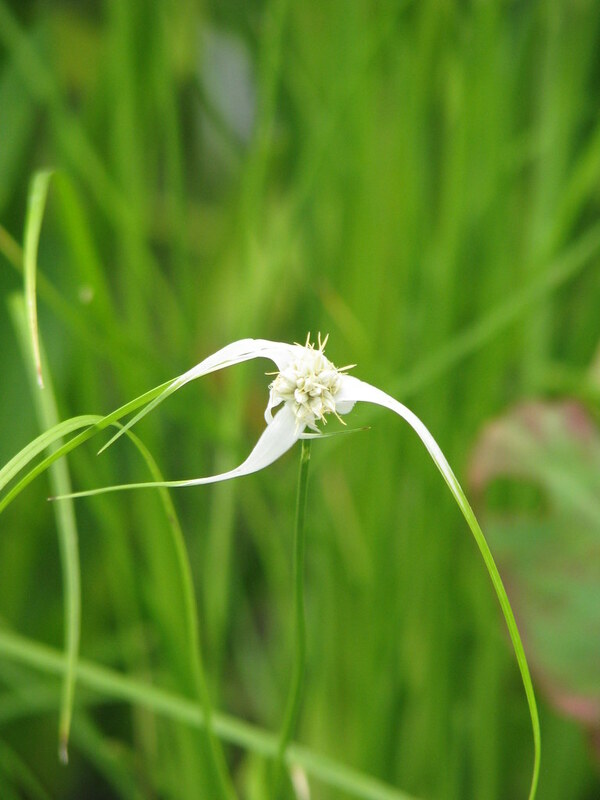 An unusual little sedge to about 12ins high, with prominent white bracts beneath the heads of flowers - a bit like an umbrella grass (Cyperus) but with conspicuous 'flowers'. 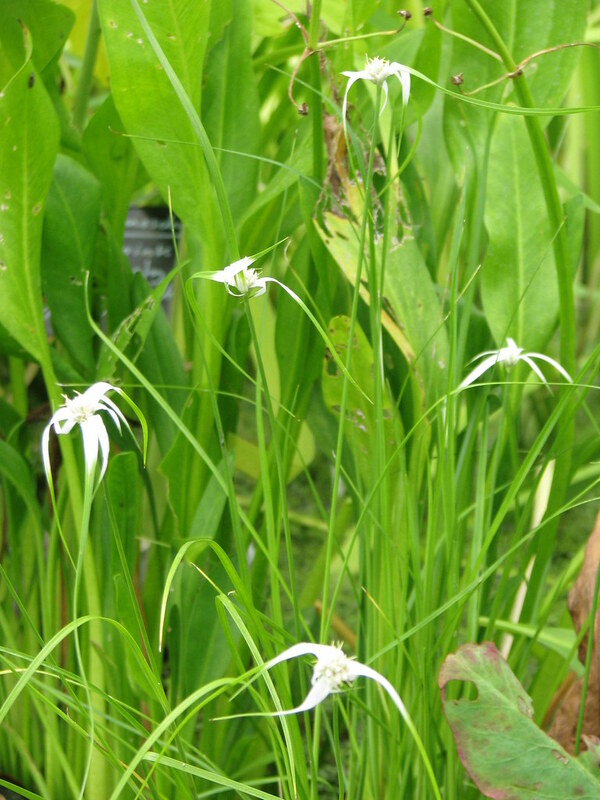 This is a wetland plant from warmer parts of the USA, often seen growing with Sarracenia (pitcher plants) in the wild. 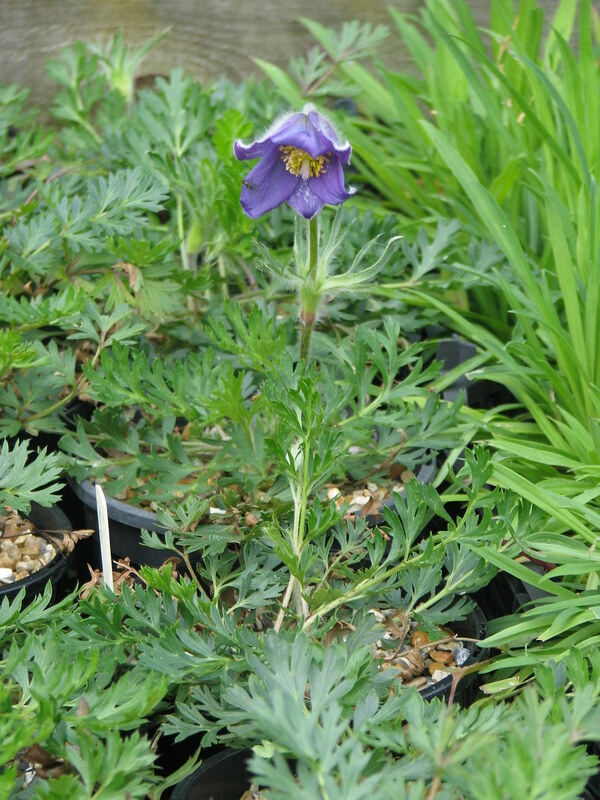 In cultivation it is easy to grow in shallow water but likely to need some protection from intense cold, and shallow water that warms up quickly in summer. Forget about the garish yellow blobs you see about the country through February and March - Forsythia has several much choicer and less overwhelming species to offer. Suspensa is in effect a giant winter jasmine (to which it is related) that can be trained in as a climber, or allowed to drape itself among other vigorous shrubs, or pruned in summer to make an arching shrub. 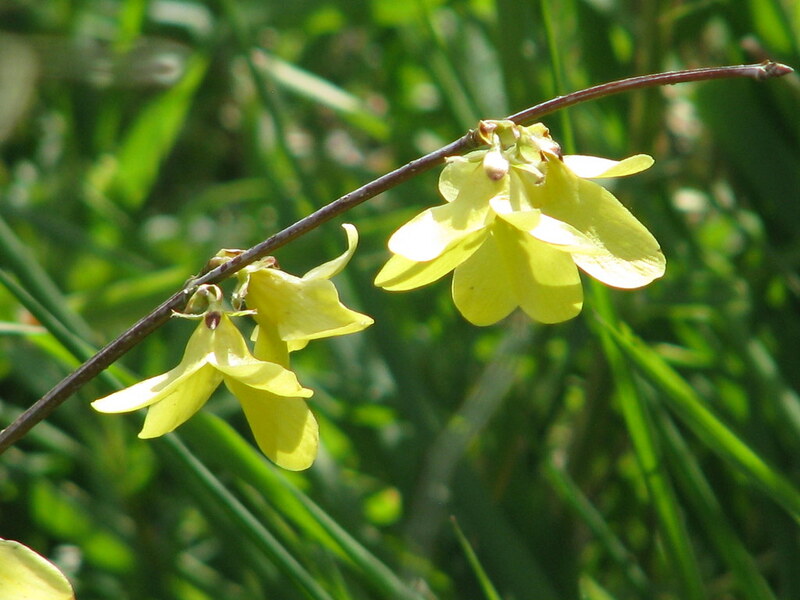 The flowers are large and nodding and pale yellow and scattered along the branches, which, in this variety, are dark purple. Really quite choice! 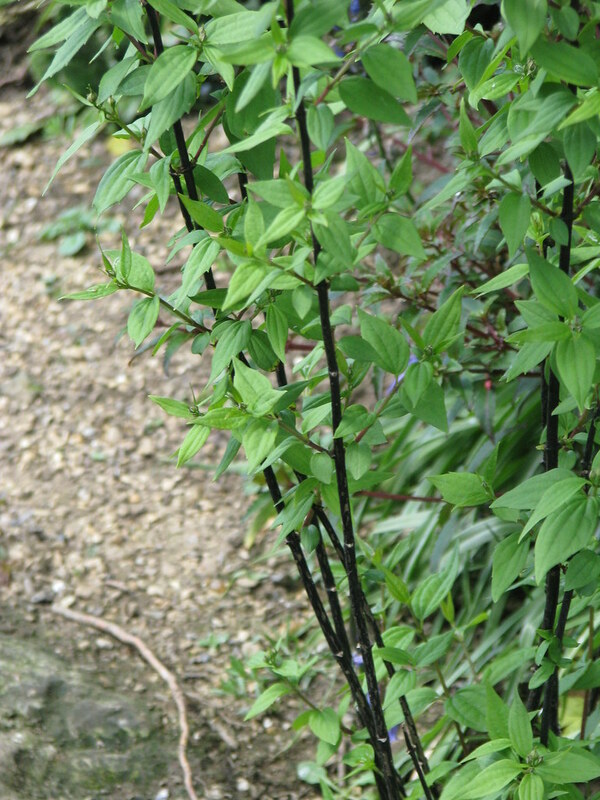 I was originally impressed by this when I saw it in a garden centre in mid winter, when it was just a cluster of rather remarkable charcoal black stems. 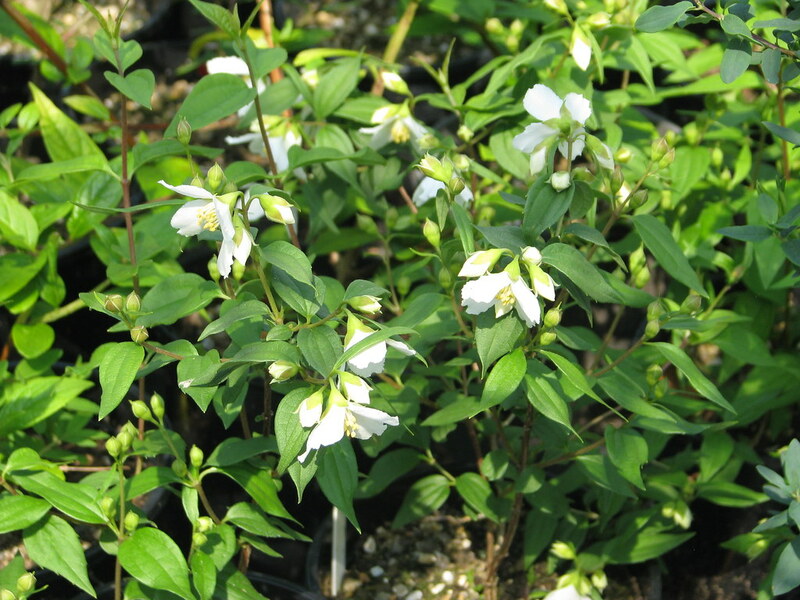 Now in flower it's proving to be a very attractive cultivar, with jagged white petals and a fresh scent. In its upright shape, modest size and neat foliage it has something of P.microphyllus about it, which is presumably one of the parents. 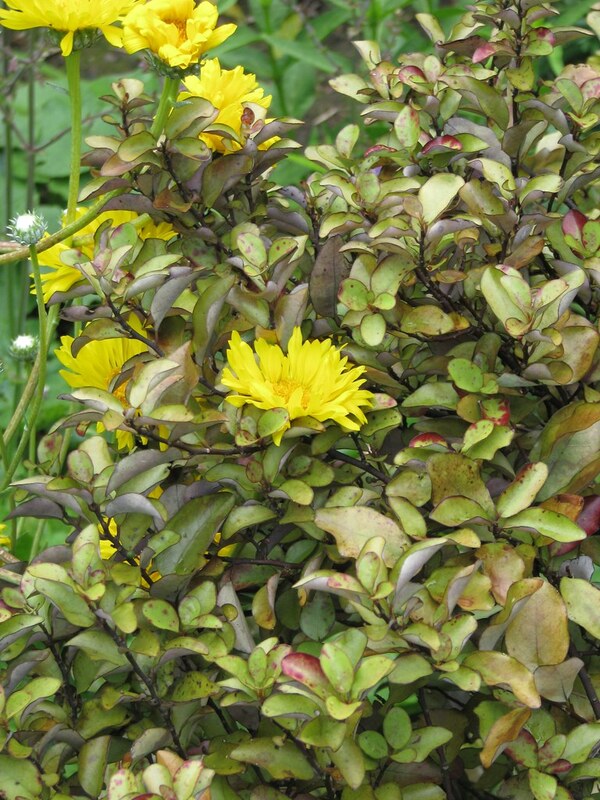 A very appealing shrub for a small garden. 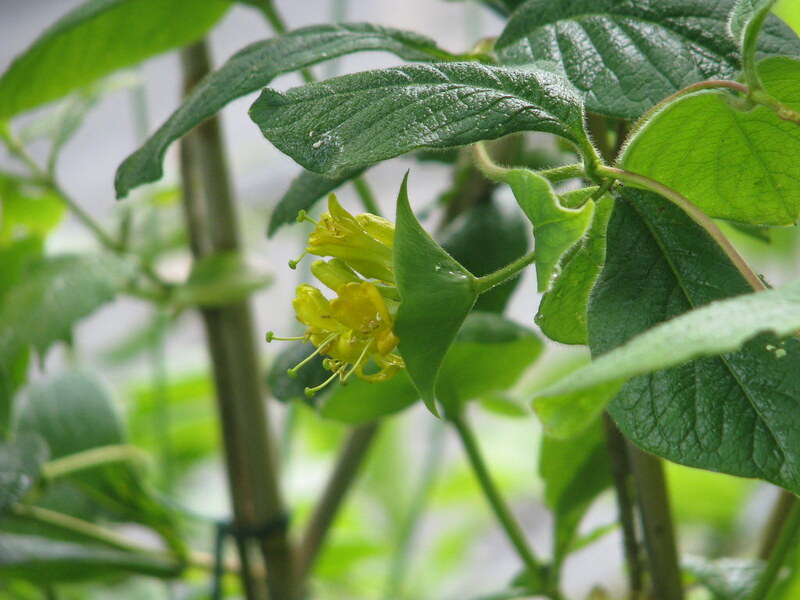 What a fascinating genus Lonicera is. 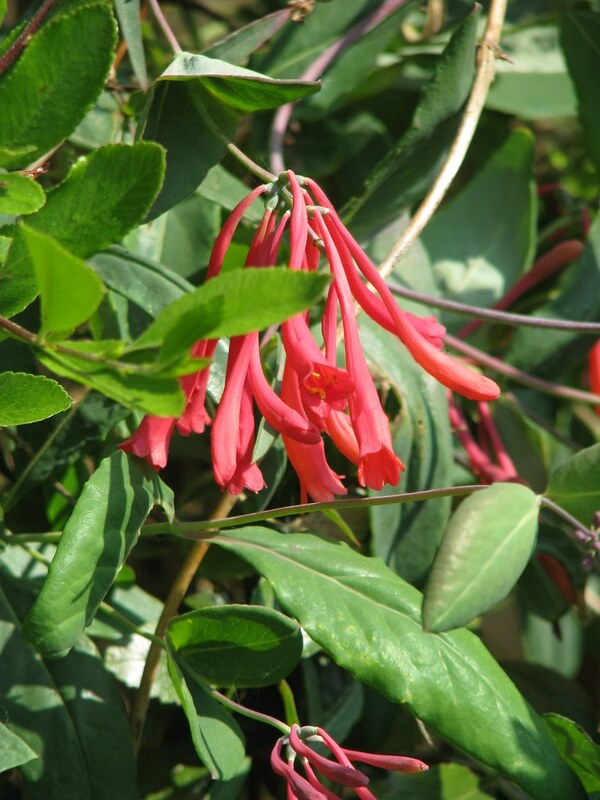 Most people I guess think of the climbing honeysuckle but there are at least as many non-climbing shrubby species, and a very varied bunch they are too. Almost all are easy and hardy in a variety of situations. 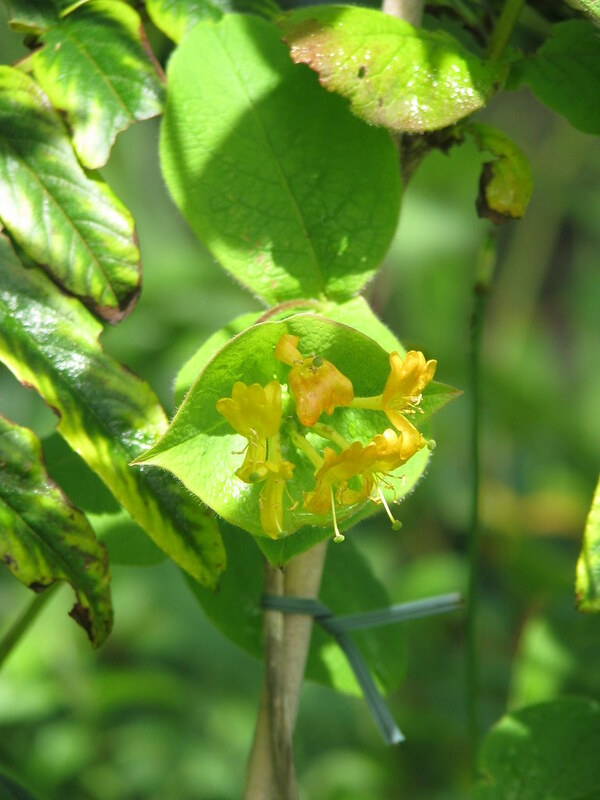 An unusual and very un-honeysuckle-like non-climbing species with pairs of funnel-shaped pale yellow flowers in a large bristly papery pinkish or yellowish calyx, which persists around the orange berries. 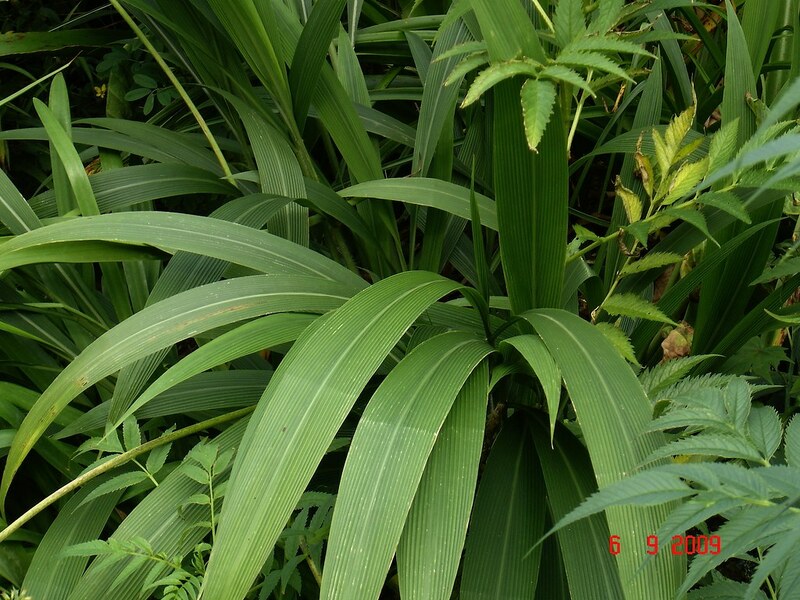 The leaves are rich green and bristly. Very easy and hardy. 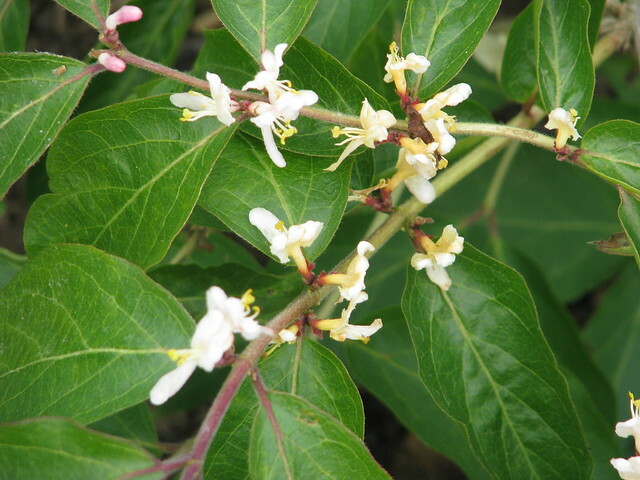 A very different species with small rounded leaves and rosy white urn-shaped flowers - almost like some sort of ericaceous shrub (hence the name). Also makes red berries. 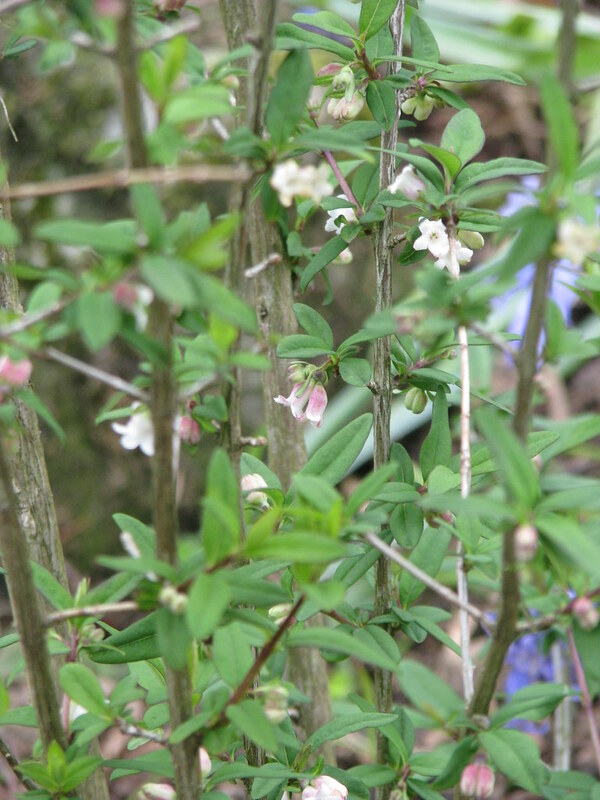 An uncommon shrubby honeysuckle with multitudes of milky white flowers in early summer, slightly touched with cream and rose, and followed by red berries.